25609 Burnaby in gated Palo Verde Country Club in Sun Lakes, AZ is a gorgeous 2,600 square foot, two bedroom, two and one-half bath home that is move in ready! 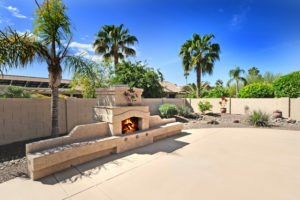 Palo Verde Country Club is one of the gated Active Adult Sun Lakes retirement communities. All information is deemed accurate and provided courtesy of ARMLS. Buyer to verify all facts, figures and square footage. Spacious open concept floor plan with kitchen, family and dining room. Separate formal living room with fireplace. Large kitchen with two refrigerators and spacious island. Master suite has travertine flooring and shower and separate make up/vanity area. Large walk in closet. Updated guest bedroom! Spacious, lots of light, large walk in closet, updated flooring and shower walls, separate make up vanity room.